CSC's Bjarne Riis predicts that the 2008 Tour de France will be "the cleanest Tour of all time." Now, that sounds awfully familiar. Where have I heard that before? Oh, right, it was in the months leading up to the 2007 Tour. Remember when everyone said that the one good thing about the Landis fiasco was that it would at least mean a clean 2007 Tour? They said that everyone would know that the spotlight was on and that no one would dare try to get away with anything under those circumstances. Ya, that didn't end up working out so well did it? So, here we go again. The 2007 Tour was not the cleanest Tour of all time - quite the contrary. But here we go again predicting that next year will be better. It's like a cheating boyfriend - "I promise honey, that was the last time, it's going to be different from now on." Riis goes on to say that "Much work has been done in the fight against doping. All teams should follow our example, because we have a strict anti-doping programme." And again, this is sounding strangely familiar to me. Where have I heard that before? Oh, right, sounds a lot like messaging that came out of the T-Mobile team prior to positive doping tests coming from Sergei Honchar and Patrik Sinkewitz. You guys know that I do my best to stay positive about the effects of doping on the sport of cycling. I try to be optimistic. I love cycling and most of the time I don't let the doping garbage get in the way of my enjoyment. But sometimes it just gets ya down when you start to feel like nothing every changes. What do you guys think? Will 2008 be the cleanest Tour of all time? Still busy guys, but I couldn't let this sad story go by without at least giving everyone a place to talk about it, fume about it, grieve over it or whatever you need to do. Today, T-Mobile announced that it's done with the sport of cycling. It has decided that the ugliness of the problems with doping is just too great and no longer something that they wish to have their name associated with. In a Velo News story, Hamid Akhavan, CEO of T-Mobile International is quoted as saying,"We arrived at this decision to separate our brand from further exposure from doping in sport and cycling specifically. This was a difficult decision given our long history of support for professional cycling and the efforts of Bob Stapleton in managing the team in 2007." "We have an obligation to our employees, customers and shareholders to focus our attention and resources on our core businesses. We have worked very hard with the current team management to promote clean cycling sport, but we reached the decision to continue our efforts to rid all sports of doping by applying our resources in other directions." One question that leaps to mind, of course, is what does this mean for Big George Hincapie? Again, in the Velo News story, Team Director Bob Stapleton said both the men's and women's teams will continue despite T-Mobile's departure, racing under the name Team High Road. That's great and all, but riders like George Hincapie and (ugh) Mark Cavendish don't ride for free and just because you say that a team is going to keep running doesn't make it so. No sponsor means no money and no money means no team. I can't have harsh feelings towards T-Mobile. Companies don't sponsor sports teams for their love of the sport, they sponsor them because it makes sense in terms of marketing. You want to link your name to something that embodies the way that you want people to view you as a company. But after the saga of Ullrich, Riis, Sinkewitz, Zabel, etc. the cost to their brand becomes too great and there is no longer any benefit for the sponsorship dollars. Best of luck to Bob Stapleton. I think he's a guy who's trying really hard to do the right thing and I think that the sport can only benefit from having him involved. But even Bob Stapleton needs to get a paycheck at the end of the day and I just hope that he's able to find someone to step in and keep the dollars flowing. The Credit Agricole team announced on Wednesday that they would not be racing Saul Raisin any time in the near future. The American rider who sustained a life-threatening head injury in a crash in April of 2006 during the Circuit de la Sarthe has a contract with the team through 2008, but team manager Roger Legeay met with Saul and his parents earlier this month to tell them the news. Legeay said that the decision was made after the team received the results from tests that were run by a series of doctors on Raisin in Bordeaux, France, during October. "He had very nice progression, but the progress is... We are in a very dangerous sport, not like tennis," said Legeay. "You have issues of concentration, it is hard to explain all the issues, it is a very demanding sport. My first priority as a manager is the life; it is not results or the money. For me it is a big risk for him to ride in the bunch. It was my decision. "I explained my decision to Saul and his parents. I said 'I want to be sure there is no risk of his safety,' and his parents agreed with me. After looking at the results with the doctors – neurologists and psychologists – from Bordeaux, we made a strong decision and take the responsibility." On his own website this week Raisin declared, "My dreams to be a professional cyclist are dead." Raisin continued, "I did very well on my neuro-psych tests but the doctors said it would be too dangerous if I were to crash and hit my head again. It is hard to take in the fact that all the last 13 years of hard training are now over." It's sad to hear that the likelihood of Raisin making the comeback that everyone had hoped for may be slim to none, but that does nothing to detract from what this young man has accomplished. Saul Raisin has made an incredible contribution to his sport, reaching levels in professional cycling that thousands of young riders can only dream of. And, perhaps even more importantly, he has been an inspiration to so many others who are going through the same struggle that he has faced over the past 18 months. On December 1, Raisin will marry his girlfriend Aleeza Zabriskie (DZ's sister). He's 24 years old and he has not only survived, but made a miraculous recovery from an accident that, by all rights, should have taken his life. Saul Raisin should have no regrets. The plans that he once had for his future will have to change, but that doesn't mean that his new plans have to be any less ambitious. You don't need to sit on the seat of a bike to do incredible things. Floyd Landis filed his appeal with the Court of Arbitration for Sport this week. This marks the Tour de France winner's last chance to overturn the two-year ban handed to him by the UCI. I can't say that I hold out much hope. I suppose we can take comfort in the face that the CAS has been known to overturn rulings against cyclits in the past. Spanish cyclist Inigo Landaluce was cleared by the CAS of doping charges in December 2006 after finding the lab technician who conducted the rider's 'B' sample had also been involved in analyzing the 'A' sample. As we all know, Floyd's case is full of similar mix-ups. According to Eurosport, in a 90-page brief sent to the CAS on Tuesday, Landis's legal team said the American rider "fully supports" the efforts by professional cycling to combat doping. "However, to wrongly strip a champion of his victory due to a flawed test result is much worse than to have an athlete cheat his way to victory," his lawyers added. I have to say that I agree. No one wants to see cheaters win, but I believe that the injustice of having soemone who won clean be wrongly accused, have his career destroyed, and his reputation forever tainted, seems far worse. Okay, today's topic for discussion: Patrik Sinkewitz was handed a one-year ban from cycling today from the German Cycling Federation for his use of a testosterone gel during training about a month before the 2007 Tour de France. The T-Mobile rider was also fined $58,556. German prosecutors dropped a criminal investigation of Sinkewitz on possible fraud charges in return for the five-figure fine. His results from the 2006 Tour de France and the 2007 Switzerland Tour have also been annulled. The German cycling body said that Sinkewitz could have received a two-year ban, but was given a lighter sentence because of his wilingness to co-operate in other on-going doping investigations. He'll miss the 2008 Tour, as his ban ends just after the Tour begins, but he'll be back in time to be in great form for 2009 if he can find a team to take him. What do we think? Fair? How about this idea that if you co-operate with authorities - and I'm not sure if that means just explaining a bit about how the doping works or if it means ratting out others in the peloton - you get off with a lighter sentence? Some great suggestions came out of my post on Monday regarding my lack of time over the next few weeks to blog. One of the suggestions was that I just post cool pics and maybe something short just to get a new coversation started and give you a clean slate for each day's chat - great idea. I also like the idea of having guest bloggers every now and then. I'll have to give that some more thought. I did take a few minutes to check in on Velo News yesterday and this picture of Dave Zabriskie working with the Slipstream team to get a 3D analysis of his time trial pedaling style made me all tingly inside. I'm honesty really tired of reading about doping and what Rassmusen said to whom and when. I can't get very worked up about race routes for next year. And I truly don't care who Lance is dating this week. But seeing photos and reading about Dave Zabriskie in a wind tunnel - now that does it for me. That's what gets me excited about cycling. The anticipation of watching DZ crouched down on that bike, slicing through the wind, busting through another TT record - that's what makes my tummy go flip flop. This photo came from the excellent technical report over at Velo News on the work that Slipstream is doing in the wind tunnel these days to get the guys ready for next season. I don't know who's doping, or who's lying, or who's dating whom, but I do know that I love watching incredible athletes ride really fast on gorgeous bikes. I'm still here and still reading your comments every day. I do apologize again for the spotty record in terms of posting over these last few weeks. I'm afraid that it's not going to get much better until after the holidays. I have a mountain of work to get done between now and then (which is great - I'm not complaining - no work means no money now that I'm running my own business) and very little time for keeping up on cycling or posting. But, I can see that you guys are doing just fine at holding down the fort so I'm going to try not to worry about you (I'm such a mom). I did catch the news about the report released by the panel looking into the situation with Rasmussen last summer and the decision by the Rabobank team to fire him in the middle of the Tour. I'm not up on all the details that they've uncovered, but I have to say that I agree with their statement that he never should have been allowed to start the race in the first place. Looks to me like Rabobank knew - or at least suspected - that something fishy was going on. They knew that he was lying to the UCI about his whereabouts prior to the Tour but they kept quiet and put him in anyway. I don't think it's enough for Team Manager Theo de Rooij to tell Rasmussen that, "The responsibility for this lies completely on you," when he found out the the Danish rider was purposely misleading the UCI about where he'd been, and thereby absolve himself of any guilt. He knew, and he didn't do anything about it. I think that makes him just as guilty in the cover-up as the Chicken himself. I think that de Rooij saw visions of a yellow jersey within his grasp, got a little greedy, and decided to take the risk and hope that no one would blow the whistle on them. But they got caught, and now that a light is being shone on what happened, he's trying to turn around and pretend like he didn't do anything wrong. Anyway, got to get back to work. Keep chatting. Make yourselves at home. I'm still around. I promise. As many of you mentioned here, world class runner Ryan Shay collapsed 5km into the U.S. men's Olympic marathon trials in New York on Saturday and was pronouned dead shortly afterwards at a local hospital. Shay was recently married to a fellow long-distance runner, Alicia Craig who also had hopes of quailfiying for the Beijing Olympics this year. Shay was only 28 and it's always sad to see someone with so much left to do taken away, but talk about a fulfilled life! Some people lie around year after year doing very little and resenting the world for not making them happier. They live long, empty lives and then die slowly and painfully in some hospital bed, miserable right up to the end. Not Ryan Shay. 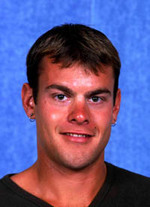 Ryan Shay loved running. He had fallen in love with a girl who loved running too and he'd married her over the summer. He dedicated himself to something and he became one of the best in the world at it. He was going to win an Olympic medal one day - probably this summer - and he dropped dead working his way toward that goal. He lived a short life, but one that many who live twice as long couldn't match for its richness. In an interview with the Free Press before the 2004 Olympic trials in Birmingham, Alabama, Joe Shay [Ryan's father] recalled his son’s work ethic. “I remember Ryan going out when it was 20 or 30 degrees below zero, because he didn’t want to miss a training day,” Shay said. “I would argue with him after he’d come in coated in snow and icicles, looking like the Abominable Snowman. I'm not sure which is responsible for the growing naseau in my stomach: the many tiny chocolate bars I ate last night, or this. Yuck! As we went from house, to house, to house, to house the people who were giving out candy all ask the kids the same questions: What’s your name? What are you dressed as? How old are you? Are you having fun tonight? By the end of the night, my daughter Grace was so exhausted that at one of the last houses, she rang the bell and as soon as the man opened the door she blurted out, “Trick or Treat. 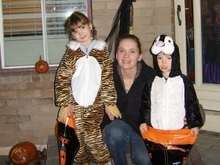 My name is Grace, I’m very tired, I’m a tiger and I’m five years old,” and just held out her bag for candy. The man looked so confused and my husband and I just burst out laughing.